There two main types of interior stairs - standard and custom. Standard stairs come in standard sizes to the job sites. They are ready for the installation and good for multiunit’s buildings. Custom stairs always build by carpenter at a job site. There are varieties of options available to satisfied customers’ needs. Most of single family houses or custom build homes have custom stairs. Building custom stairs is a very precise work and requires skills and experience. 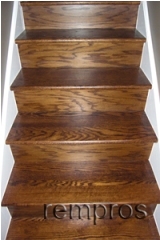 It is possible to replace pretty much all types of materials on stairs and install hardwood. If it is a carpet, after demolition you need to take some additional steps of preparation before actual steps will be installed. Substrates steps under carpet have nosing, which needs to be cut. 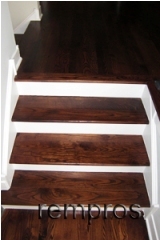 A lot of homeowners ask which type of hardwood floor can be installed on stairs. The answer is any type, but it has to be glue down type of installation even for floating types of the floor. Actual steps or stair treads as well as stair risers can be installed as one solid piece or separate hardwood floor planks. If there are planks it is necessary to install stair nosing on the treads as well, but some homeowners in their contemporary houses want steps without nosing. It is a time consuming process for the carpenter because the edges have to be made and finished by hand tools on a job site. Solid hardwood on stairs can be easily refinished and if you are thinking about changing color the process is pretty much the same as refinishing usual solid hardwood floor. A lot of homeowners complain about noise when you are walking on the stairs, especially in older buildings. In order to eliminate that, sometimes it is necessary screw solid hardwood to the substrate steps. It is better to do before refinishing and then patch and refinish hardwood. If new hardwood will be installed preparation process has to be properly done prior to installation. Installation of hardwood on stairs is a project that any homeowner should consider hiring professional even though, you might think it not that complicated and able to use hand tools. But for your general knowledge or if you want to try do it yourself learn how to install hardwood on a custom size stairs.